What the Sleepy Animals Do at the Audubon Zoo is the second book featured on the Reading Trail. The NPL periodically replaces the stories and offers new activities so children and parents can have fun being active and learning together. In this story, Renee asks her father why the zoo animals are snoozing all day, and receives her father’s rather elaborate answer. Renee doesn’t believe her father’s tale at first, but dads have a way of being right about these things. Written by Grace Millsaps and Ryan Murphy, and illustrated by John Clark IV and Alyson Kilday, this reading exhibition to help ward off any winter mental malnutrition has a distinctly Louisiana flavor that children and parents can enjoy while exercising their bodies and minds over the course of the 0.2-mile circular trail. Each of the 20 stations includes pages from the book along with facts and activities to perform. The book is also available for checkout at NPL. 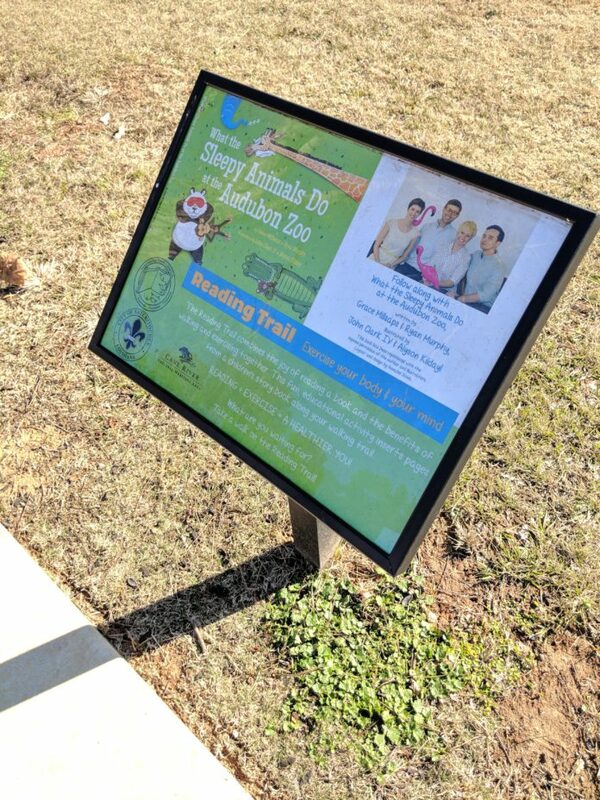 The Reading Trail is located in Pierson-Mallett Park at 701 East 5th St. and is a joint effort of the NPL, City of Natchitoches and Cane River National Heritage Area. Pierson-Mallett Park was renovated last year. It features several themed play areas and a paved walking and reading trail.